A very simple grocery delivery service. No Minimums - No Mark-Ups - No Special Account Set-Ups - No Memberships! Fill out the form below and provide your shopping list along with date and time- frame for delivery. Select morning or afternoon delivery service. 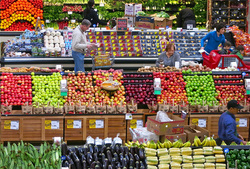 If a specialty store is required, we can shop at Whole Foods, Fresh Market or Trader Joe's. Submit your information and we will email an invoice for you to pay your one time $35 shopping and delivery fee. If you need other services (private guides, day planning, tickets, etc. ), simply email us your list and continue shopping. No need to fill out multiple forms. We will delivery your groceries and include the receipt. You can meet us at the hotel to accept and pay for your groceries. If you're busy, we will deliver your groceries to the bell services desk (if they have refrigeration). Simply click "Save My Card" when you pay your delivery fee and that's how we will charge you for groceries. 3.5% credit card fee applies. We do not mark-up groceries or limit your item choices to what we buy and have in stock. We will go to the store of your choice, shop for what you need and deliver it to you. Our local stores are Publix Market nd Winn Dixir but we are happy to shop at a specialty store if needed. If you require products from more than one store, please visit our Vacation Concierge page and see "Errands". Disney World Resort Hotels: We deliver to all Disney resorts other than the Swan and Dolphin. Disney resorts have bell services desks that can accept deliveries and provide refrigeration. You can contact the bell services desk and they will bring your groceries to your room. International Drive hotels, SeaWorld area hotels, and Universal area hotels: Most hotels do but some hotels do not have a bell services desk and you will need to be present at the time of delivery. We will set up a more specific time in these situations and the driver will contact you approximately 10 minutes before arrival so you will not have a long wait in the lobby. You may contact our office at 407-778-1973 for details regarding your particular hotel. Other Orlando area hotels: We will provide delivery to hotels in Kissimmee, Clermont, the airport area and Downtown Orlando area hotels for an additional fee of $10. ​If you need additional services while on vacation, give us a call at 407-734-5195 and we can take your reservations over the phone. It's much easier than filling out multiple forms. Please provide the cell number of the primary contact person for this delivery. We call 10 minutes prior to delivery if you are meeting the driver at the hotel or we will call you as soon as we drop off your groceries at the bell services desk. No need to look up the address of your hotel. We know them all! If there are several hotels with similar names, we will call you to ensure proper delivery. Morning (between 9 and noon) Afternoon (between noon at 5pm) I need to be present. Call me to set up a delivery time. Please be as specific as possible including brands and sizes if you have that available for up to 25 items. Please note that some items and brands may differ or may not be available as they are in your home store and substitutions will need to be made. We will make every effort to get exactly what you are looking for.